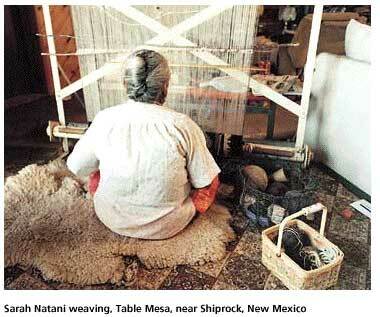 "Weaving, it's part of the culture. If you're a troubled person, if you sit down to your weaving, your bad feeling all goes away and the good one comes in. Then you start thinking about your pattern, and when you have a real fine and very good wool to work with, it really builds up your design. The pattern comes to you naturally." Photographer Lucy Capehart, a museum educator and curator, is known for her wide-open color landscapes, domestic interiors, and for being responsive to the people and subjects she is photographing. Her images show us the importance of sheep to Navajo life and traditions through photographs of Churro, fresh mutton for sale, and beautifully woven traditional rugs. 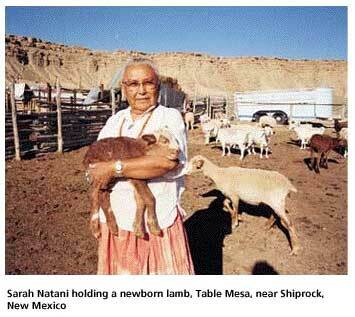 DBI leader Sarah Natani is seen in her sheep corral and her rugs are shown in her hogan.